Today's trio of Flyknit Chukkas is rounded out with this all new Miami Hurrucanes-inspired look for the fall. The Miami Hurricanes-like color scheme is brought to life with sequoia green covering msot of the innovative Flyknit upper on this Chukka, working together with total orange over the laces, Swoosh logos and heel tabs. hits of black are also seen through the knitted areas, while a white Lunarlon sole provides the perfect amount of contrast below. 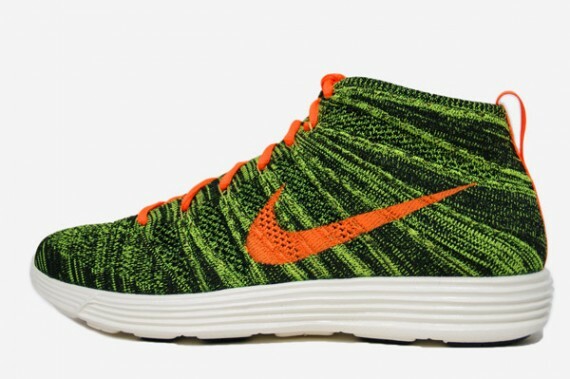 Stay tuned to Sole Collector for further details on the Black/Total Orange-Sequoia Lunar Flyknit Chukka by Nike Sportswear.